A glimpse of this just happened when terrorists killed a priest in France. They took five people hostage: one priest, Father Jacques Hamel, two nuns, and two parishioners. The terrorists forced Father Jacques, an elderly priest yet still very active in his community, on his knees in front of the church with the video recording. When Father Jacques tried to defend himself, the terrorists slit the priest’s throat. They intended to decapitate him. 5:33–The punishment of those who wage war against Allah and His Messenger, and strive with might and main for mischief through the land is: execution (by beheading). 8:12–I will instill terror into the hearts of the unbelievers: smite ye above their necks. Since 2015 in France, Islamic terrorists have targeted publications (Charlie Hebdo) and the public (Paris, Nice). 130 were killed in November 2015, and then 80 more in Nice last month. Islamic militants have been targeting Christians, particularly ministers and religious leaders in many countries. This is war, a Holy war, a clash of civilizations, and yet in the West, elected leaders are either not fighting hard enough, or refuse to call this evil by its name: Islamic terror. That church in France went from a House of Peace and Love to a Warzone of Blood and Terror. Our brothers and sisters in Christ have experienced this persecution in many parts of the world. Churches burned, pastors killed, houses of worth up blow up with people in them, even set on fire. We are seeing a rising attack on Christians and the church in Nigeria, Syria, Congo, Sudan, India, Indonesia, dozens and dozens of countries. They don’t get the press. And the Church is basically silent about the merits and victims of the enemies of Christ. 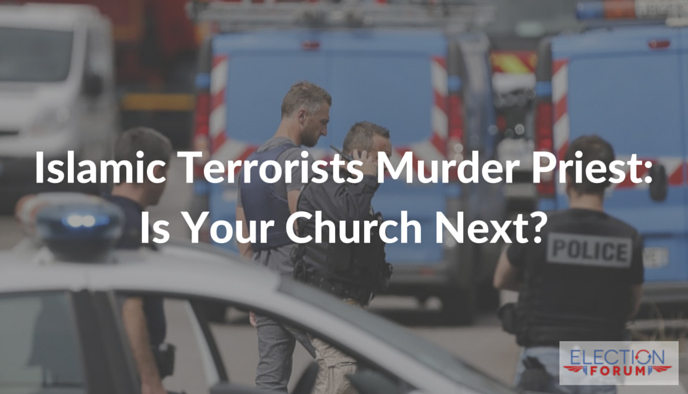 For a number of years, I’ve warned about the potential of a terrorist attack at an American church. I still believe a matter of time we will see that as well as an escalation of worldwide attacks. Is your church prepared? Is it taking the necessary precautions? As followers of Christ, we do not live in fear, the love of Christ gives us the basis for joy, peace, and hope. The killing in the black church in South Carolina by a mentally ill racist, of people gathered for bible study and prayer shocked the nation. That the body of Christ recognize that there is a cost for serving the True and Living God. Indeed, there is a cost for standing for Christ. We must stand firm, must not give in to fear, we must not give into hate. But we must be prudent, and protect ourselves, have a plan to ability to spot and prevent these type of acts. I attend a church which is NOT a gun free zone and where there are strategically placed ushers before, after and during the service. Our pastor in not politically correct and not stupid/naive about security. Many of us congregants are former military and some former gang-bangers, not unwilling to get physical quickly if necessary to protect life and limb. Wow–I wish we had more guys like Bruce Carson in my church–good job brother! It’s obvious that there is only one presidential candidate that acknowledges the need to vet incoming Middle East refugees to protect America from Islamic terrorism, and that candidate is Donald Trump. If we don’t rally around him and help with his election campaign, we will only have ourselves to blame when Hillary allows an increase of 550% refugees. Let’s learn from Europe and not make the same mistake! Many months ago, Rev. Franklin Graham, CEO of the Christian charity, Samaritan’s Purse, wrote an extensive article about the Middle East refugee crisis. In it, he stated that America should not allow Muslim refugees to come to America at this time because Sharia law is not compatible with Western Civilization, and Islam is at war with us. He compared the situation to being at war with Japan, where America interned all Japanese Americans in camps until the war was over. He said it is far better to send aid to them in the Middle East than to have them come here at this time. He also stated that less than 1% of the refugees being allowed entry to America are Christians, yet they are the ones who have been targeted the most. What has delayed the introduction of a solution is, once again, political correctness. There is no such thing as “radical islam”. George Bush introduced the term so as not to upset everyone. A “koran light” that only the good muslims read does not exist. There is only one koran and the so called radicals are simply the only ones willing to follow all of the precepts of it and obey its every verse, which includes the beheading of non-muslims. It is time we call it what it is and deal with it accordingly. You want to know how to instantly stop suicide bombers? Take the remains of the next one and feed him to the pigs. This act will stop him from reaching his reward of heaven and 72 virgins. Once they understand this will happen to them and there is no chance for reward of their actions, there will be no reason to blow one’s self up. This is another reason to defend and vote for candidates who want to support the 2nd Amendment. If at least one person had a legally concealed weapon in the locations of the recent terrorist shootings in America, perhaps the number of killed would be far less! Not just law enforcement, but everyday citizens who are trained in the use of a firearm for defense. Defending life is important and electing representatives who honor all life from the womb to the grave is without question. And in light of the tenuous state of affairs around the world, would this candidate build our military or cut it and make us weaker? There is no question at all when it comes to which presidential candidate would call terrorism exactly what it is and will work to build a stronger military and stop the influx of foreign nationals who cannot be vetted. We Christians need to take another look at the principles we allow to guide us at the polls! We’ve “principled” ourselves into irrelevance and a national loss of biblical principles. We are not electing a religious leader; we will always be electing a flawed person to lead a flawed people. Remember the perfect candidate doesn’t exist. When voting don’t just consider the candidate, but also the issues we face. Which of the candidates is gong to make decisions that are best for the whole nation? And whose policies more closely align with the Word of God? We are Americans and we should not forget the history we had as a world leader, we can and must get back to that God given heritage.